Policeman shot to death while driving to Kiryat Arba with family for Passover seder, his pregnant wife is hospitalized. Terrorists opened fire on a family car near Hevron in Judea, murdering the family's father as he was driving, mere minutes before the Passover holiday began on Monday afternoon. The man, a police officer in his 40s from the center of the country, was killed instantly by the gunfire. He was from Modi'in, security sources told AFP on condition of anonymity. His pregnant wife was wounded, and evacuated to the hospital in a condition defined as moderate to critical. Additionally a nine-year-old child was lightly wounded in the gunfire. Paramedics who rushed to the scene attempted to resuscitate the man, but were forced to pronounce his death at the scene. His wife was wounded by bullets that hit her in the waist. An IDF helicopter was dispatched to scour the area for the terrorists, and likewise large IDF forces were sent out on the search. The nearby Arab village of Idhna, located to the west of Hevron, was closed as part of the IDF operation, given that the shooter apparently came from the village. 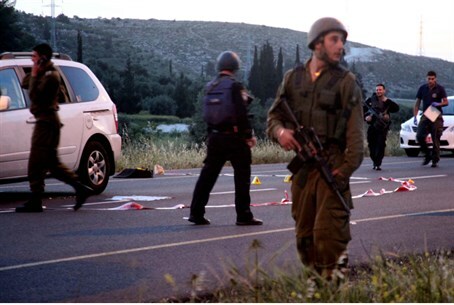 Israelis in another car say they saw a man in a helmet on the side of the road firing a Kalashnikov assault rifle. IDF spokesman Peter Lerner said it was unclear if the attack was the work of a lone shooter, a shooter with accomplices, or a "local terrorist organization." "A great loss to the family and the security forces"
Internal Security Minister Yitzhak Aharonovich arrived Tuesday at the Shaarei Tzedek Hospital in Jerusalem to visit the injured widow of the murdered man. "I met the widow, she is a very strong woman. I knew her husband, a member of the security forces, we worked closely together," remarked Aharonovich after the visit. Regarding the murdered man, Aharonovich noted "he was a very ethical and professional man, this is a great loss to the family, and of course to the security forces." Aharonovich hinted that the attack was carried out by a group of terrorists, and not a lone shooter. "She (the wounded woman) told me that the family was on its way to Kiryat Arba to have the seder meal, and one or more terrorists stood and opened fire," described the minister. It was a "murderous terrorist event, the act of a terror organization that attacked," according to Aharonovich. "She was wounded by several bullets and her husband was apparently murdered on the spot. The children sat in the car in back."